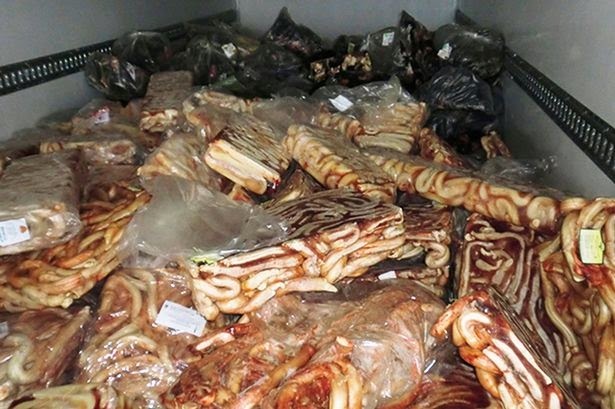 Officers came face-to-face with plastic bags filled with a ton of animal meat of the most unappetising kind. Cops made a grizzly discovery when they stopped and searched a lorry...coming face-to-face with a ton of bulls' penises. The intimate animal parts were dumped in plastic bags at the front of the vehicle. They were hidden behind boxes to disguise the fact that they were being transported illegally. 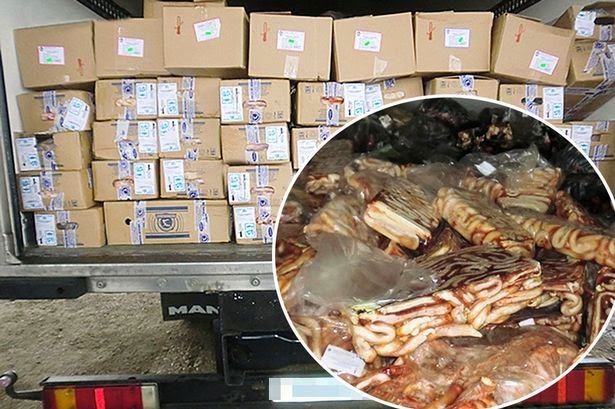 Police said none of the products offered were fit for human consumption and were being illegally transported from the neighbouring country of Belarus to Russia when they were stopped at the city of Briansk. Cop Arthur Pokrovskii said: "There were also ears, cartilage and veins which in total together with the bull penises weighed just over six tonnes." He added that all of the produce had been carried with fake documentation describing it as meat fit for human consumption. But he added: "It was not being properly transported nor had any of the usual veterinary paperwork been provided. It looks as if it was heading for Moscow to be sold on to restaurants and butchers which would have then passed it onto the general public." He said that in most cases the animal waste would have been chopped up and added to items like minced meat or sausages and sold on to unknowing customers.